Edited by Barbara Segall, the highly regarded horticulturist and garden writer, whose other work includes many books and contributing to Gardeners World, The Garden, Country Life, Country Living and the Times. 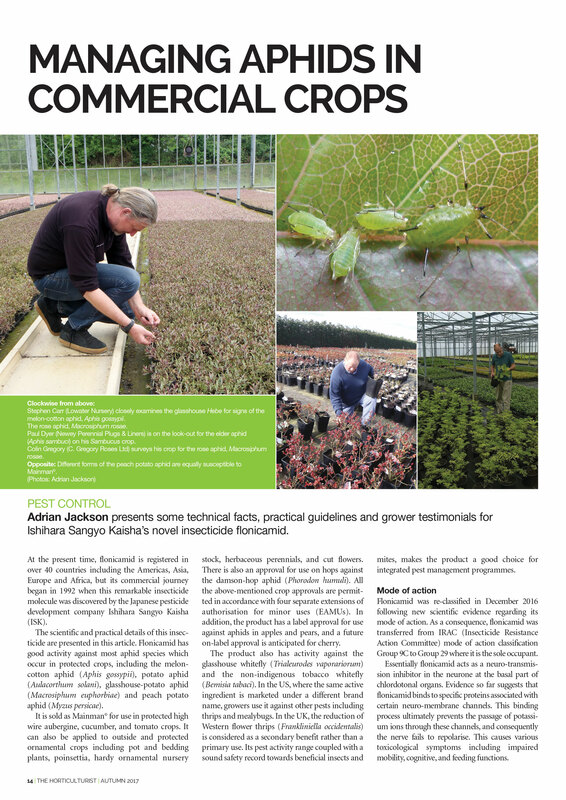 The Horticulturist is a quality, full colour, A4 publication, which is produced three times per year in April, July and October. It contains all the vital news and information needed by members of the CIH, who collectively represent a powerful and influential audience of professionals engaged in all aspects of horticulture including, production, managing, growing and marketing of edible and decorative crops, allied research, education and consultancy, landscaping and maintenance of botanic and heritage gardens, as well as both leisure and supply industries. 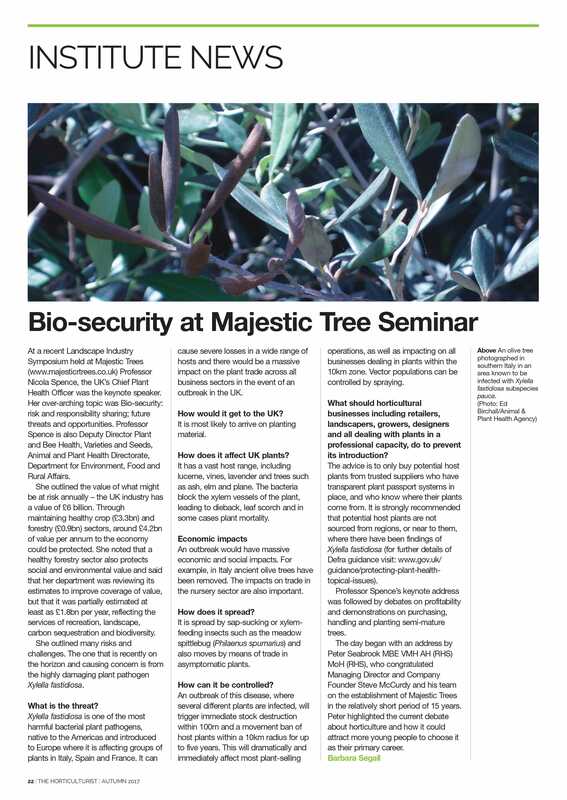 The Horticulturist delivers access to a highly significant group of decision makers and professionals. The Chartered Institute of Horticulture Established in 1984 the Institute is the organisation representing those professionally engaged in horticulture. It aims to foster a close relationship between all sectors of horticulture. It consults with Government and other policy-making bodies on matters of interest or concern to professional horticulturists; to confer recognised status upon professionally qualified and experienced horticulturists, and to promote educational and training opportunities, by encouraging the development of all disciplines within horticulture. Since its inception the Institute has facilitated a close relationship between all sectors of professional horticulture (advisory and research, amenity, commercial and education and training) throughout the UK and Ireland. The Institute is a registered charity, governed by a Council of Trustees. 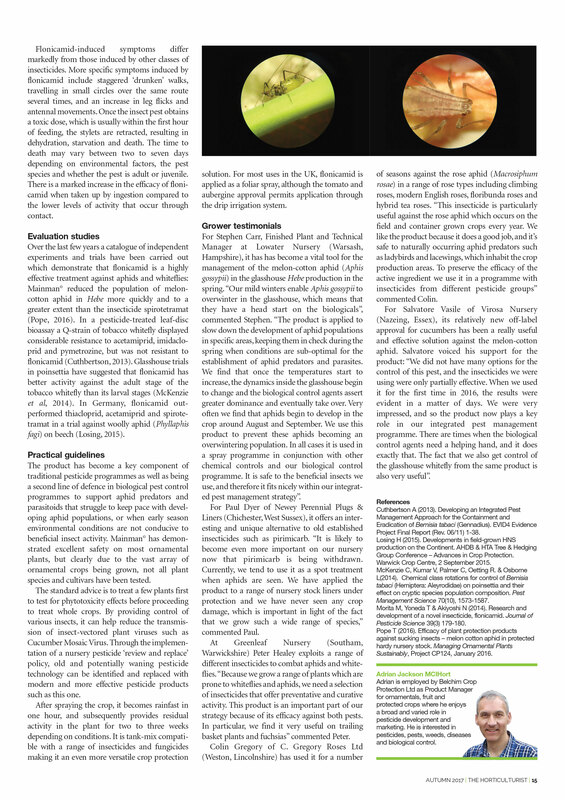 The Horticulturist magazine Edited by Barbara Segall FCIHort, an award winning horticultural editor and writer, The Horticulturist is a high-quality, full colour, A4 publication, produced three times a year in April, July and October each year. It contains all the vital news and information needed by members of the Chartered Institute of Horticulture including regular features on a wide range of relevant subjects. 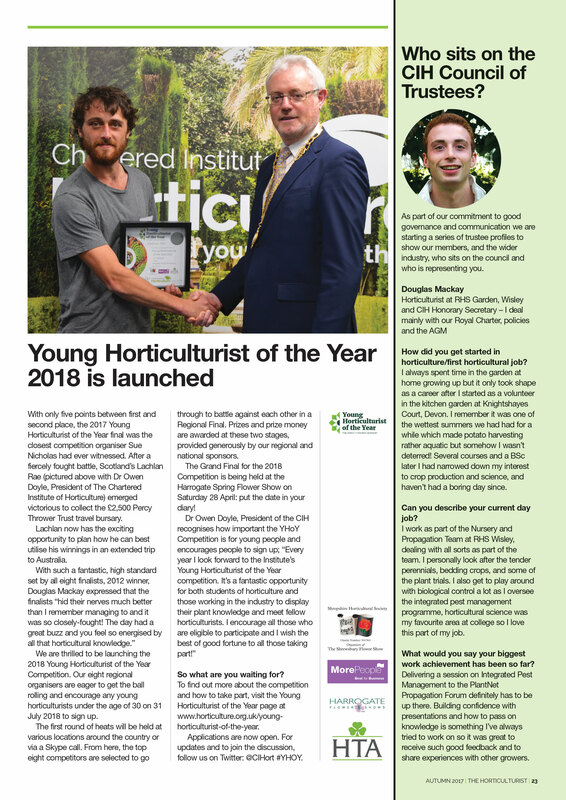 The Horticulturist provides advertisers with direct access to this highly significant group of decision-makers and professionals in a topical publication full of information about the issues that concern them. It is used by members both as a method of communication and as a source of reference. For companies and organisations offering horticultural products and services the members of Institute collectively represent a powerful and influential audience of professionals engaged in all aspects of horticulture, including production, managing growing and marketing of edible and decorative crops, allied research, education and consultancy, landscaping and maintenance of botanic and heritage gardens, as well as both leisure and supply industries. Many of the members of the Institute are working at the highest levels right across the industry. They often either make or are instrumental in purchasing decisions and the control of budgets. Membership of the Institute brings recognition of status to those within the horticultural industry. Over 93% of the Institute’s members hold the top three levels of membership: Fellow 19% Member 59% Associate 12% Membership of the Institute is not open to all, you need to qualify for membership by proving that you have enough experience, knowledge and skill to be accepted. Applications for membership at any level need to be supported by a referee, copies of certificates, a curriculum vitae, and confirmation of employment or study. Higher membership grades can only be achieved through career development and additional experience or academic achievements. Membership of the Institute, and the recognition of the professional standards members must achieve to use the letters FCIHort, MCIHort and ACIHort after their names, highlights the quality of audience offered by The Horticulturist. The Institute comprises and represents all who are involved in the man and varied aspects of horticulture, plus those who work in associated supply industries; it is an extremely influential and powerful organisation. Membership criteria To be a Member of the Institute, or accepted as Associate, Affiliate or Student, you must be working (paid or unpaid), or have worked in or be studying wholly or largely horticulture, or be in a branch of science or arts directly linked with horticulture. Admission to the grades of membership is based on a combination of horticultural experience and qualifications. Those who are new to the industry are Affiliate members. Student membership is available to those currently studying for an academic qualification that will enable them to join as an Affiliate, Associate or Member. Fellowship Fellowships of the Institute are awarded to individuals who have achieved a significant profile in their professional capacity, in a field of interest or expertise which contributes to the charitable objectives of the Institute. Fellows are entitled to the letters designate FCIHort. A standard insert is the equivalent of one A3 sheet or less when unfolded. All inserts must be no larger than A4 when folded, and should be supplied ready folded. All advertisements and loose inserts are vetted by the Chartered Institute of Horticulture and a sample of loose inserts should be supplied to the publishers for approval well in advance of the publication date.